Andrew Edward Bruflat, age 92, of Radisson, WI Passed away in the early morning on Tuesday, April 2, 2019 at the Hayward Area Memorial Hospital. Andrew Bruflat was born on the family farm on February 4, 1927 in the Town Of Brigham, near Barneveld WI, the son of Anton and Gemanda (Anderson) Bruflat. During the Great Depression years, the family moved from Barneveld, to Blue Mounds, and finally to Mt. Horeb where they settled and eventually built a home. While in High school, Andy worked for relatives on their farms and part time at the Cave of the Mounds, where his father had done much of the stonework for the entrance and visitors area. After graduating from Mt Horeb High School he joined the Army Air Corp on September 8, 1944 as an Enlisted Aerial Engineer. While in the Air Corp he attended the University of Southern Illinois with studies in the mechanical engineering program. After a long ship ride to Europe, Andy was stationed at various locations in France and Germany where he served as Crew Chief on a C-47, and several other aircraft. He was Honorably discharged December 4, 1946 ; and for his service he earned the Victory Medal and the Army of occupation Medal: Germany. After his release from active duty, Andy returned to Mt. Horeb where he worked as a mechanic for his brother Leonard, and various jobs for the Railroad. After a short period of time, Andy and a friend decided to seek adventure and employment in Alaska, hitching a ride on a long cold flight in a war surplus C-47 full of chickens, flying north from Seattle to Anchorage. While in Alaska, he worked unloading cargo ships during the day, helped rebuild the burned out Palace Hotel at night, and would ice skate in his free time. He also earned his Private Pilots license in a Piper Cub at Merrill Field in Anchorage. When Andy returned to Wisconsin, he went to work doing carpentry for Badger Ordinance near Sauk City. While in Sauk City, Andy met his future wife, Donna Shimniok, who he married in 1956. Together they moved initially to Milwaukee, and then to a small home on two acres in Brookfield, where they began their family. Andy first went to work for the Wellenstein & Son Co. as a finish carpenter, and completed his working years with E&F Drywall. His beloved wife Donna passed away in 1965 from cancer, leaving him three young boys to raise on his own. 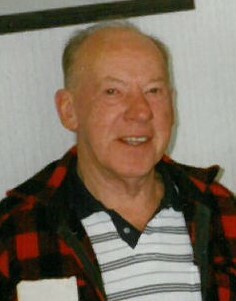 After his retirement in 1987, Andy moved to the Blueberry Lake property he had purchased in 1951, and spent many quality years there fixing, repairing, fishing with children and grandchildren, and generally sharing his infectious laugh and profound knowledge. One of the highlights of his later years was taking the controls of a Piper Cub on floats owned by John Frisbie of Round Lake, and spending an hour “slipping the surly bonds of earth” high above his home. Andy would be the first to say to everyone, that he just wanted to be left alone, yet on many a summer night, he could be found at the fire with family or friends, sipping his J Bavet, with his hearty laugh echoing across the lake under the stars. He never forgot where he had come from, lived a full life, and was grateful for what he had. Andy enjoyed working and being outdoors, fishing, playing “Elmers Tune” on the piano, and adeptly coaxing the hammer and saw to sing. He was also very fond of his martini’s and a cigar, especially if a Pontoon ride was involved! Andy is survived by two sons; Steven (Roberta) Bruflat, Brian (Katheryn) Bruflat, both of Radisson WI; six grandchildren, Jamie, Lucas, Heidi, Eric, Hannah, Ryan, several great grandchildren; and many nieces and nephews. Andrew was preceded in death by his parents, Anton and Gemanda; wife Donna; son David; Four brothers, Rueben, Burnell, Alvin, Leonard; and two sisters, Ruby and Orene. Military honors will be accorded for Andrew at 11:00 am. On June 1, 2019 at the Greenwood Cemetery in Hayward. Following the military service a celebration of life will be held at the Veterans Community Center in Hayward. There's still time to send flowers to the Graveside Service at the Hayward Greenwood Cemetery at 11:00 AM on June 1, 2019.